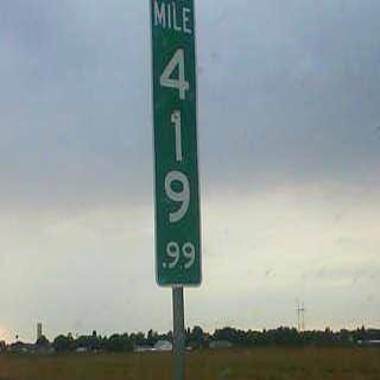 Amy Ford of the Colorado Department of Transportation says the "MILE 420" on a highway was stolen repeatedly, and officials replaced it with a sign that says "MILE 419.99." A sign marking the mile 420 on a Colorado highway was replaced with one that reads "MILE 419.99" — after the old one was repeatedly stolen by weed-enthusiasts, according to the state’s transportation department. The 420 sign on Interstate 70 east of Denver was altered “within the last year,” but a Twitter post on Friday attracted attention to the low-key new sign over the weekend, Amy Ford, the communications director at the Colorado Department of Transportation, told NBC News Sunday. The number 420 has long been a codeword for marijuana smokers, although the origin of the slang is hazy. Colorado only has one other highway that runs long enough to need a 420 mile marker and although the department of transportation hasn’t changed that one, they did move a 69 mile marker half a mile and label it 68.5 to avoid theft, Ford said. While a difference of .01 mile doesn’t sound like much, the 419.99 marker stands more than 50 feet away from where the old sign was posted. “We are nothing if not precise,” said Ford. But Ford remained lighthearted about the situation. "It’s just one of those funny things," she said. "I expect they’ll still get together in celebration," she said. Ford also expects the 419.99 sign won’t last much longer, even though the change has effectively warded off souvenir-seekers in the past. “I’m sure with all attention we’ve gotten, it’ll disappear again,” she said.